To paraphrase, when the going gets tough, the tough grab a good survival knife. Of course, the knife also has to have toughness, which happens to be one of the principles characteristics of knife blades, along with strength, hardness, edge, wear resistance and stain resistance. Strength in a knife is the ability to take stress without permanently deforming or breaking. Using a knife to pry is a good test of strength. Softer steel in the blade makes it easier to bend it but at a certain point may bend permanently. Softer steel blades (i.e. cheap ones) are very difficult to sharpen, or may not hold an edge at all. Harder blades have greater strength and can usually take a sharper edge. Hardness is a measure of the ability of a blade to take stress without deforming, that is, a test of strength. The knife industry commonly uses the Rockwell Hardness C Scale (HRC) to measure the hardness of a steel blade. You’ll see these numbers often in knife specifications. High Hardness (HRC 60-65) – At this level, edges hold very well but at the upper end 63-65 the steel is relatively brittle and subject to chipping. Medium Hardness (HRC 58-60) – This is the ‘general purpose’ level of hardness, which has good strength and will hold an edge fairly well. It’s the most common Rockwell hardness for survival knives. Low Hardness (HRC 52-58) – This is the softer level most suitable for blades that will receive high impact, such as axes and meat cleavers (see toughness below). Toughness describes the ability of a blade to take impact without damage and is the most desired characteristic of a good survival knife. It’s especially important for uses such as chopping or digging, when the blade may encounter something as hard as it is. Toughness is in a general negative dynamic with strength. That is, the harder the blade, the more strength it may have, but it becomes more brittle and loses toughness. For example, ceramic knives are extremely hard with an almost permanent edge, but they are fragile and subject to chipping or breaking. 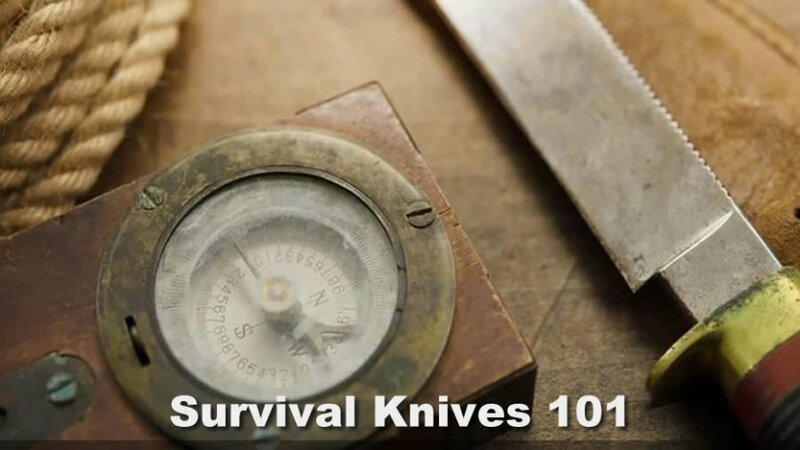 Most survival knives use blade steel that sits somewhere in the middle of qualities for strength (hardness) and toughness. Edge is a two-sided characteristic of a good survival knife – taking and edge, and holding it. In many, if not most knives, they are not the same. Some knives take an edge well; but lose the edge quickly. There are difficult to sharpen knives that hold an edge for a long time. The thinness of an edge determines its sharpness. Of course, the flipside is that very thin, very sharp edges may easily lose their sharpness – or fold and chip. Edges are created by a combination of blade geometry, the shape and structure of the steel, and the specific grind. Sharpening a knife is usually a matter of maintaining the edge produced by a grind. Wear resistance is the ability of a blade to withstand abrasion. This is most obvious in the ability of a blade to take and hold an edge but also applies to the entire blade. It’s mostly a function of hardness, but varies a great deal between manufacturers – even with similar Rockwell hardness. In the next Survival Knives 101 we’ll take this discussion of blade characteristics, briefly, to the next level – “blade steel” of a good survival knife.